Point Pleasant senior Christian Holland (3) breaks tackles as he runs up the field, during the fourth quarter of the Big Blacks’ 55-13 win on Oct. 12 in Rocksprings, Ohio. Last Game: Point Pleasant defeated Meigs 55-13, in Rocksprings; Man defeated Wyoming East 24-21, in New Richmond. Last meeting between the teams: Oct. 20, 2017. Point Pleasant won 45-0, in Point Pleasant. Current head-to-head streak: Point Pleasant has won 4 straight. PPHS offense last week: 367 rushing yards, 241 passing yards. MHS offense last week: 206 rushing yards, 63 passing yards. PPHS offensive leaders last week: QB Cason Payne 12-of-18, 207 yards, 2TDs, 1INT; RB Brady Adkins 20 carries, 158 yards, 2TDs; WR Brady Adkins 5 receptions, 144 yards, 2TDs. MHS offensive leaders last week: QB Jeremiah Harless 4-of-5, 63 yards; RB Zack Frye 7 carries, 66 yards, 1TD; WR Quentin Moody 2 receptions, 11 yards. PPHS defense last week: 19 rushing yards, 244 passing yards. MHS defense last week: 169 rushing yards, 105 passing yards. 1. These teams first met on the gridiron in 1962, and Point Pleasant has won five of the six meetings. The Big Blacks’ .833 winning percentage over Man is tied for the fourth-best among teams PPHS has played at least five times. 2. Last week was the first time Point Pleasant has cracked 600 yards of total offense since chalking up 637 yards in a 61-12 win over Gallia Academy in Week 3 of the 2016 season. It was the fourth time in six games that PPHS earned at least 20 first downs, with the Big Blacks falling one shy in each of the other two contests. 3. 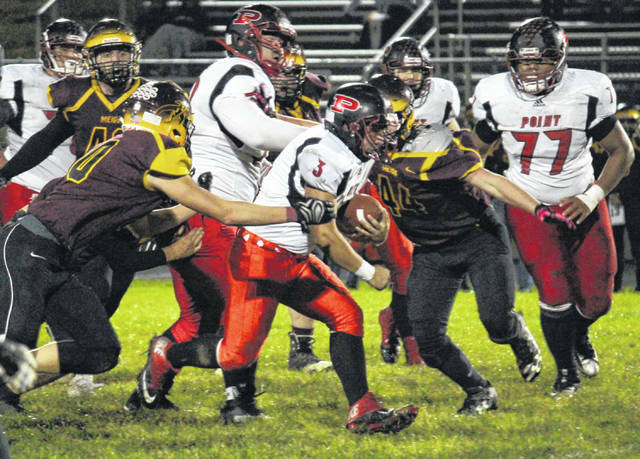 Point Pleasant has scored 42 touchdowns so far this season, with 10 different players finding paydirt. Brady Adkins leads the way with 13 scores, followed by Cason Payne, who has found the end zone 10 times. Nick Parsons has eight touchdowns, Josh Wamsley is next with four, followed by Christian Holland with three and Andrew Jones with two. James Musgrave, Brayden Connolly, Logan Southall and Hunter Bush each have one touchdown on the year. 4. Man started last weeks game by returning the opening kickoff 76 yards for a touchdown, and went up 12-0 early in the second quarter. The Hillbillies were outscored 21-to-12 over the remainder of the contest, but held on for their third one-possession victory of the year. 5. Point Pleasant enters Week 9 at sixth in the Class AA playoff rankings. Eight other Class AA teams have at least six wins, but only Fairmont Senior, Poca and Nicholas County can match Point Pleasant’s loss-total. Man is currently 21st in Class AA. Last Week: Buffalo defeated Valley (Fayette) 33-13, in Buffalo; Hannan lost to Montcalm 50-13, in Montcalm. Last meeting between the teams: Sept. 23, 2011. Buffalo won 55-0 in Buffalo. 1. The series between these teams began in 1938, and the Bison hold a 25-1 all-time record. Hannan’s only win in the series came in 1957, by a 19-13 count. 2. Last week, Hannan trailed by just two points at the end of the first quarter, but was outscored 35-0 over the remaining three periods. 3. Hannan has been outscored by a 285-to-69 count in its six games this season, while Buffalo has been outscored by a 282-to-89 clip in seven contests. 4. This is the senior night game for the Wildcats. HHS has four seniors on its 2018 roster. The Bison bring nine seniors from their squad. 5. Buffalo is tied with Hannan’s last opponent, Montcalm, for 38th in the Class A rankings. Meanwhile, Hannan is tied with Buffalo’s last foe, Valley (Fayette), for 42nd in the rankings.